This property is directly associated with the initial period (1902-1920) of downtown commercial expansion that occurred due to local economic prosperity after the Klondike Gold Rush and in tandem with explosive population growth and suburban residential development. During this era, modern urban architectural scale began with the construction of the earliest steel-frame high-rise buildings and the establishment of a concentration of banking enterprises and department stores along Second Avenue from Cherry Street to Pike Street. The initial regrading of Denny Hill and the commercial redevelopment of the former University Grounds (University/Metropolitan Tract) were major factors that facilitated northward and eastward commercial expansion. In 1914, the owners of the Frederick and Nelson Department Store purchased property with the intention of building a large, five-story store at Fifth Avenue and Pine Street, thus solidifying the location of the future downtown retail core. A significant number of extant commercial properties dating from this era remain within the downtown commercial core, including: numerous hotels, banks, business blocks and early high-rise commercial buildings, as well as some specialty and department stores, clubhouses, apartment houses and theaters. Buildings that provided multiple-family housing in Seattle was not identified or described specifically as “apartment houses” prior to c.1903. During the late nineteenth and well into the twentieth centuries, numerous downtown hotel buildings functioned for long-term residential purposes. By 1905, several small apartment buildings had been constructed and were mingled primarily among the older single family residences located uphill and to the NE of the expanding commercial district. Many appear to have been located in proximity to Providence Hospital and Central School near Sixth Avenue and Madison Streets, while other apartment construction was concentrated further uphill along Yesler Way and on First Hill, as well as in burgeoning neighborhoods like Capitol Hill and Queen Anne Hill. As Denny Hill was removed and regraded in phases, small mixed use apartment buildings began to be constructed on the newly regraded lots. By the late 1910s, larger apartment houses had been constructed in the Denny Regrade area to the north of Stewart Street. During the 1920s, two large apartment hotels were constructed in the commercial core; however, major apartment house construction did not occur. Such development was heavily concentrated in residential neighborhoods, particularly First Hill and Capitol Hill where numerous noteworthy examples from this era remain. The Highland Apartments (also known by its other historic name, The Laveta) was originally designed and constructed as a three story apartment building in 1903 for a Mrs. J. E. Gandalfo. 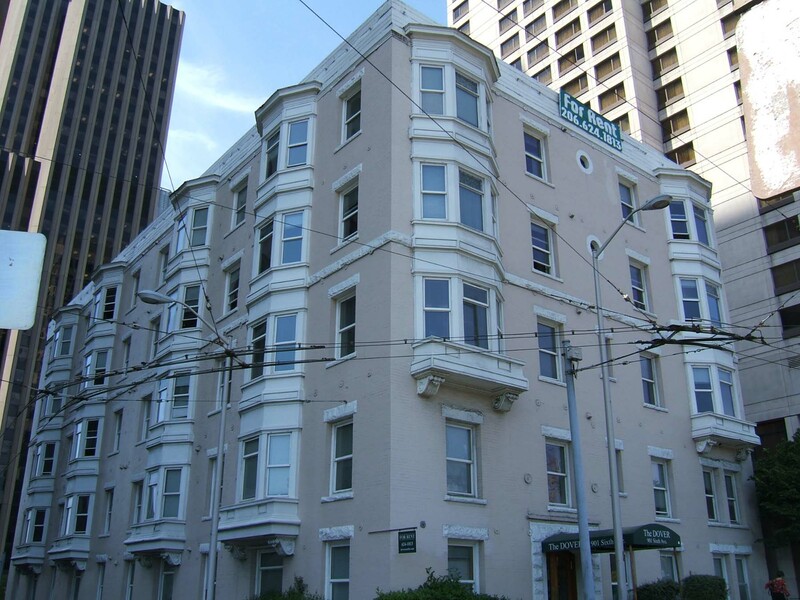 It is the oldest and only extant “apartment house” or domestic property in downtown Seattle and was one of several apartment buildings that appear to have been historically located in proximity to Providence Hospital and Central School near Sixth Avenue and Madison Streets. The original three story apartment building (now the upper floor levels of the existing building) was designed by the local Seattle architects, Thompson and Thompson. Charles L. Thompson and his son C. Bennett Thompson began to practice in Seattle in 1898 and are know to have designed several local business blocks including the Sartori Block (Moses Building, c.1900), hotels, residences and a synagogue prior to 1912. In 1912, a major three-story addition to the building was constructed for Howard S. Amon at a cost of $100,000. This project appears to have been undertaken in conjunction with the regrading of the adjacent streets, Sixth Avenue and Marion Street. Rather than add three stories to the top of the existing building, the existing apartment building was raised while the surrounding streets were lowered, and a new concrete foundation with three additional stories were constructed to support the existing structure. The plans for this project were prepared by Seattle architects Blackwell and Baker. The architect, James E. Blackwell, was born in Virginia and practiced in Washington, D. C., and Rochester, N.Y., in the late 1880s. He arrived in Tacoma in 1891, doing work on dock projects in Port Orchard and Portland. He arrived in Seattle in 1897, working in partnership with Robert I. Robertson (1897-1904) and Frank Lidstone Baker ((1911-14). Baker was a graduate of the University of Pennsylvania. During this partnership, in addition to this apartment house, the firm designed the Grand Trunk Dock (destroyed, 1911) on the Seattle waterfront and the Armory in Bellingham (1911-12). This building has survived not only the construction of the Interstate 5 Freeway (probably due to the presence of the U.S. Federal Courthouse a block away) during the 1960s, but also the major modern era of high-rise development during the 1970s and 1980s. It now stands in sharp contrast amongst the surrounding office and hotel towers. Despite some exterior alterations, since the 1912 expansion, the Highland Apartments are generally well-preserved and the building is an outstanding and rare example of a downtown apartment house property type from this era. It is one of the few remnants of the residential district that was absorbed by commercial development between 1902 and 1930. It is also associated with two notable architecture firms from this era Thompson and Thompson and Blackwell and Baker. Located on a steeply sloping grade at the NW corner of Sixth Avenue and Marion Street, this five-story building houses approximately 80 apartment units. The building has primarily functioned as an apartment house but it has also been used for hotel purposes. It measures 57’ x 120’ and has an irregular E-shaped plan that allows for three lightwells at the north side of the building. Three upper floor levels of the building were constructed c.1903 and the building was expanded to its current height/design with the addition of the lower floor levels c.1912 when the adjacent streets were regraded. The lobby entry is on the east (Sixth Avenue) elevation with a secondary basement level entry at Marion Street. The ordinary masonry structure includes a concrete foundation and full basement level and is primarily clad with red brick that has been painted pale pink. The basement level that is visible at the Marion Street elevation and a narrow band at the base of the Sixth Avenue façade are clad with rusticated sandstone and/or cast stone. Both elevations are distinguished by polygonal bay windows; at the narrow Sixth Avenue elevation there are two bay windows each symmetrically placed in the outer bay of the façade and extending from the third through the sixth floor levels, at the much wider south elevation four bay windows are symmetrically placed off the center of the façade and extend from the 2nd through the 6th floor levels. Each of the wood-frame bays rests on a square base supported by ornate wide brackets and is terminated at the (former) cornice line with a slightly decorated cap and flat roof. A stone watertable runs along the length of the south and east elevations at the 4th floor level; this appears to be a remnant of the original 1903 façade and served to define the base of the original three-story building. The bare parapet wall is now visible since the ornate wood and metal cornice has been removed. Window openings are symmetrically placed on both elevations; typically rectangular and individually set with cast stone sills and heads. The only variations are two small oculus windows and two small rectangular windows at the center of Sixth Avenue façade. All of the existing 1/1 double-hung wooden windows appear to be original or closely match the original (1912) windows. The segmental arched lobby entry doorway with wooden doors is off-set to the south and has a cast stone surround. An original steel and glass marquee has been removed and replaced by modern canvas entry canopy. A small interior entry vestibule is located at Sixth Avenue. It is distinguished by a second set of segmental arched wooden doors leading to the lobby, a segmental vaulted ceiling, marble capped metal wainscot with a faux marble-painted finish and green glazed terra cotta floral wall trim. The small entry lobby and adjacent central stairwell include original wooden running and standing, dark-stained wood trim and doors and faux green marble-painted wainscot paneling. Reportedly, the apartment units have not been remodeled or altered. "Apartment House on Marion Street" Seattle P.I., August 24, 1912.